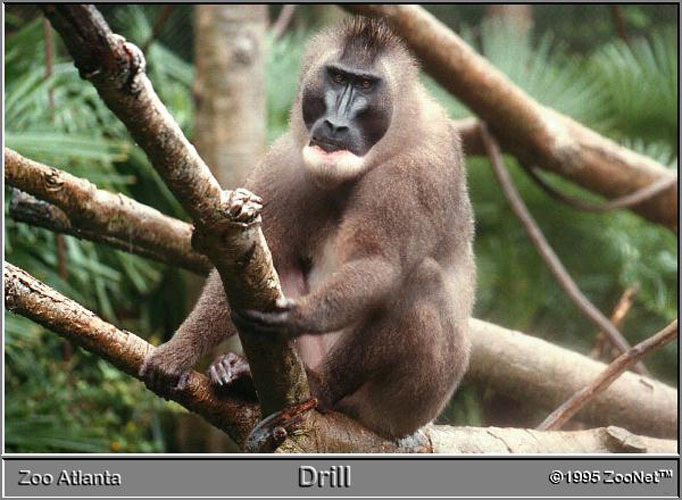 The drill is a short-tailed forest baboon weighing about 15 kg (33 lb). It is found in tropical rain forest, where it subsists on a diet of fruit, seeds, fungi, roots, insects and small animals. The drill is semi-terrestrial, feeding mainly on the ground. The drill has a flexible social organization. It lives in groups of up to about 20, consisting of a male, several females and their young. These groups may gather into super-groups of up to 200. The drill is found within a range of less than 40,000 sq km (15,000 sq mi) in western Cameroon, southeastern Nigeria and Bioko Island (Equatorial Guinea). The major reasons for the drill's decline are hunting for food and habitat loss and fragmentation due to development, logging and agriculture. *** In 1995 the IUCN rated the drill as the highest conservation priority among African primates with regard to species vulnerability and habitat value (Gadsby 1995). *** Hunters report that it is declining in terms of group size and group density, and super-groups are rarely encountered (Gadsby 1995) . *** Other than in Korup National Park in Cameroon, there were no studies of the drill undertaken between the late 1960's and the late 1980's. Even as of 1996 the distribution of the drill was still uncertain, but it appeared to be restricted to a range of less than 40,000 sq km in western Cameroon, southeastern Nigeria and Bioko Island (Equatorial Guinea). It may occur in Gabon (IUCN 2004). The major reasons for the drill's decline are hunting for food and habitat loss and fragmentation due to development, logging and agriculture. The drill weighs about 15 kg (33 lb). The drill is found in tropical rain forest. Mating apparently occurs throughout the year. The drill eats fruit, seeds, fungi, roots, insects and small animals. The drill is semi-terrestrial, feeding mainly on the ground.